The Institute of Robotics has changed to the Institute of Robotics and Intelligent Systems. 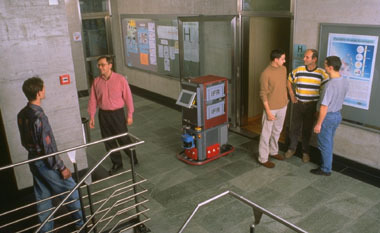 The Institute of Robotics was part of the Swiss Federal Institute of Technology (ETH) in Zürich, Switzerland. It emerged from the Institute of Mechanics in January 1990. The new institute was led by Prof. Dr. Gerhard Schweitzer and participated in the interdisciplinary Mechatronics Group of the ETH. Within the scope of mechatronics its members performed research on the dynamics of controlled mechanical systems. Typical research areas included robotics and magnetic bearings. For representing the activities in magnetic bearings, the ETH research group International Center for Magnetic Bearings (ICMB) was founded in 1990. The spinoff company MECOS Traxler, specializing in the industrial application of magnetic bearings, was founded in 1988. In October 1995, Prof. Dr. Andreas Stemmer joined the Institute of Robotics, focusing on research at the nanometer scale. As of February 2001, Prof. Stemmer's nanotechnology group became an independent unit within the department of mechanical and process engineering. By the end of March 2002, Prof. Schweitzer retired. He is running now a private Mechatronics Consulting (www.mcgs.ch). His successor is Prof. Brad Nelson (wwww.iris.mavt.ethz.ch), having started in October 2003.